Scientific Toys On Card And Paper Circa 1910. 1) Model Semaphore: Triangle of card surmounted by a disc printed with letters, printed in blue, with two moveable semaphore arms. Move the arms to the correct place to send semaphore messages. 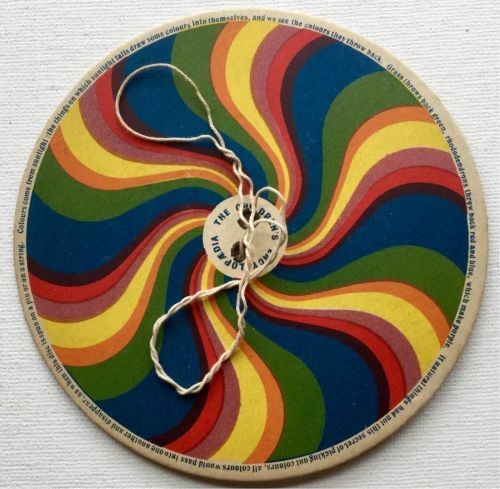 2) Spinning Colour Wheel: Circle Of Card with printed colours and two central eyelets and string. Spinning the disc blends the colours. 3) The Revolving Kaleidoscope: In original envelope with printed instructions. Small square of colour printed card which is intended to revolve on a string. 4) The Flying Swallow: Paper in swallow shape with tin weight at head end. 5) Word Game: Card letter tiles (unseparated) with printed instructions for game. 6) Toy Mutascope: Circle of card printed on both sides, pierced with slots. To be held to a mirror and rotated on pin. 7) Spinning Disc printed on card in black and white, intended to be spun on a “round stem”. 8) Three black and white cards printed on each side: eg. cat and bird on one side, birdcage on the other. When attached strings are twisted between the fingers, the bird appears in the cage – with two others. 9) Pocket compass: Small circle of card printed as a compass, with rather rusted compass needle. 10) Wonder Box spinner. An advert spinner for the Wonder Box “ a sealed surprise for Boys and Girls”. The first wonder box is “now ready”, and this spinning wheel, cut with slots, enables the viewer to read “Wonder Box” through the spinner. 11) Why The Sun Never Sets On The British Empire. Turning a disc showing the British Empire marked in red on a world map, shows that some part of the Empire is always in the sun. 12) Panorama Of The Spinning Earth: This toy, a colour printed spinning disc on a black and white printed card, shows the earth in cross section with oceans and mountains. 13) The Wondergraph: A white circle of card with numbered seemingly random cut out slots. Rotate the card on a pin, and draw through the slots in number order with a pencil, “and you will be surprised with the result.” My own experiments included! 15) The Lineagraph: “….will help you make thousands of beautiful designs with the greatest of ease.” Printed card, tracing paper ( with previous owner’s patterns in pencil), in original envelope with printed instructions. 16) Clock Of The World: Printed card in black and red, with revolving disc world map to each side( Northern and Southern Hemispheres) “Showing the Time in any Country at any minute”. 17) Multiplier: A revolving wheel printed with numbers which are solutions to multiplication problems. The top card has numbers to 40, allowing multiplications for up to 19x 40. 18) The Wonder Box Penny Puzzle: Thin yellow paper with circular hole. “Can you get a Penny through this hole?” The solution is in issue Number One of “Boys and Girls”, a Magazine given away with the Wonder Box. ( see item 10). 19) Sun Dial: Printed yellow sun dial card with card gnomon to cut out and mount in slot cut in base. With printed instructions. 20) The Wonder Box Post Office: Small printed and folded card “post office front counter” with letter slot ( slightly torn) envelopes, stamps, pet postal order etc. In original envelope with instructions. Rust staining/ hole to envelope. 21) How The Union Jack Is Made: Small booklet with two red printed overlay leaves, which make the Union flag with the white cross on blue of St Andrew as the underlying leaf. 22) The Magic Mirror: Black Card with Gelatine “ mirror” and several cards with distorted figures. When placed in front of the curved mirror, the images appear true. Rather misted gelatine, but the I,ages just about discernible. In original envelope with printed instructions. 23) The Fish That Wakes Up: Thin fish shape which curls in response to moisture or heat. Still found as “cracker” toys today. Complete with original envelope with printed instructions. 24) The Kinetoscope: A black and white printed card with cut out slots, cotton thread. Rather worn, folded. Joining the ends of the card, and spinning the result on the thread, should produce a “moving image” on the inside. Rather an ambitious toy which no longer works well because of fold. 25) The Mystery Of A Dead World Sining In Space: How the Moon lights up the earth. Yellow card, printed with the sun, and with a revolving disc with cut outs revealing the phases of the moon. A note on the card states” Bind To Face page 2219 of the Children’s Encyclopædia “. 27) Booklet of red and green printed pictures given away with the next issue (16) of the Encyclopædia. 28) The Optical Pictures: Card printed in black and white with three printed optical illusion images which are seen together when the card is brought close to the eye, e.g. mouse is seen in trap, girl feeds elephant etc. 29) Surprise Toy: White card printed with maze like shapes. Placing tracing paper over the card, and following the maze lines presumably produces an image. 30) Scale Rules: Printed card of scale rules with instructions how to use them. 31) Optical Toy: Blind spot experiment. Printed card showing footballer and ball. Moving the card close to the eye makes the ball disappear. 32) The Animals That Change Colour. Printed card showing a red pig and blue elephant with instructions. Looking fixedly at the images and then a white card produces an different coloured image. 33) The Balancing Bird: A bird shaped printed card with weight(s) ( one lacking) on each wing tip which balance the bird on a fingertip. 34) The Child’s Picture Spelling Card: Printed Card with a spelling game to help to spell seventy two words. 21 pictures of well known objects are surrounded by letters e.g. an arrow has an “N” and a “J” adjacent, spelling Narrow and Jarrow etc. 35) The Puzzling Squares: Printed Card showing 64 black and white squares which when cut up and rearranged, can make 65 squares. Uncut. 36) Eccentric Circle: A small card printed with instructions and a red circle with volvelle attached. Moving the volvelle causes three red dots change to black dots. 37) Boomerang: Small printed blue card with press out boomerangs. One of two, the smaller, missing. 38) Watch The Rat: A Wonder Box toy. Printed paper toy. Two printed paper sheets overlaid one upon the other. Moving the sheets causes the image of a rat to move from one cage to the other. 39) The Wonder Of Day And Night: Printed Card with volvelle which revolves to show the earth on sun or shadow. Some pencil annotation in a juvenile hand.